For the last few weeks, my son and daughter literally lost their capabilities to communicate and getting along well. The constant bickering, stubbornness, competition, disrespect and fights got worse. Not only did we lose our peace in our home that but they carried their unacceptable behavior out of the house to family visits and public places. We mostly tried calling off their fights, giving parental advice and sometimes stern warnings which only helped momentarily. They pushed the limits of my patience. Eventually, I lost it, this past Saturday during a visit to my brother’s. It was already a hard day with few incidents and I could not stand to listen to my daughter’s whining while my son purposefully pressing her buttons. I told them to put on their coats and boots, because we were leaving. Suddenly leaving my brother’s house, only 15 minutes after we’ve arrived there, left my brother, SIL and my mom in shock. I don’t think my borther and SIL ever saw me that angry. During the ride back home, we were in dead silence in the car. My daughter fell asleep as my son was quietly pondering on what’s going to happen to them. He was aware that I was infuriated. During the ride, I calmed down and just started to brainstorm. I needed a long term solution. I needed something that would make them think about their behavior every single hour, every single day. I needed a program to help them learn communicate better by practicing. When we came home, my daughter kept on with her nap. I gave my son a haircut and he went in to take a shower. In the meantime, I prepared this poster. 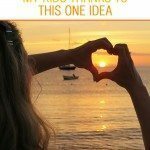 I talked to my husband about my plans and he agreed. Once my daughter woke up and my son dressed up, we sat together in the living room to explain about the “First think, then act” program I put together. When I asked them to come to the living room, to have a talk, my son was quite worried. First, we reminded them their unpleasant and mostly unacceptable behavior towards each other in the recent weeks. Then, we pointed out they have to work on improving these behaviors. 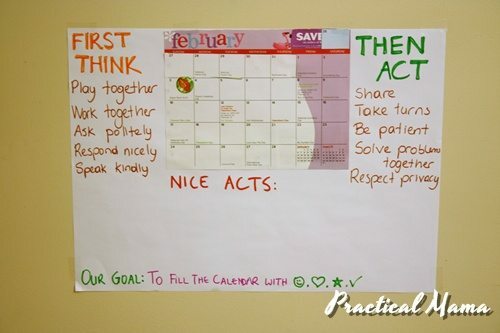 Whatever we have been doing wasn’t working, so we introduced our month-long plan to help them make new habits. We put a calendar for the next month. We listed the behaviors they have to work on. We gave examples during the conversation. 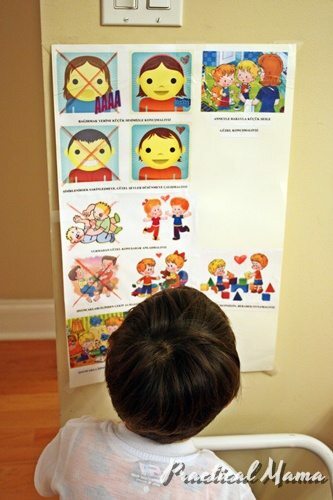 Their goal is to practice these good behaviors all day long to get a green smiley face, heart, star or check mark (they made these up) at the end of the day. 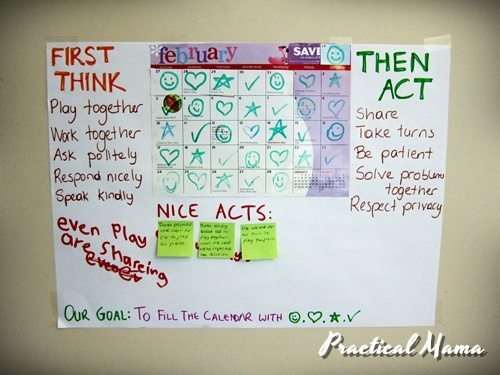 The daily behavior evaluation is not individual and outcome affects to both, so they have to work together, guide each other, cooperate and communicate so that they do not get an X. We’ll write exemplar behaviors and actions on post its and stick them to the empty area below to recognize and appreciate. If either of them behaves inappropriately or both of them fight, they get a red X for that day. Even though we haven’t really promoted this as a reward or punishment program, the positive outcome of this monthly program will help them earn back some of the privileges they’ve lost due to their behavior. 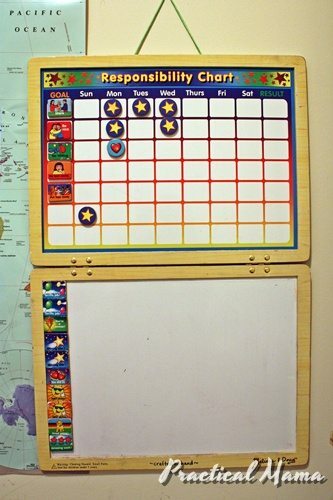 They are not allowed to spend any time with iPad, iPhone, computer (games) and TV until they fill that calendar with green icons. They haven’t protested that much, either because they were expecting something harsher or they have confidence in themselves. I am not sure. We taped the poster on the wall of the living room. They read the desired behaviors every time they pass. I tried to keep the negative verbs out of my poster and out family talk as much as possible. Today was day 1. This morning they were playing together and cooperating so well, my eyes teared up. They cleaned up the basement together. Towards the end of the day, I admit, there were some moments, when we had to remind “think first, then act”. At the end of the day, they got a green smiley face. I will post the developments and the results on a weekly basis.